The young people participating ranged from eight to seventeen years of age. We organised them into four groups, with five facilitators. Apart from mindful sitting and mindful walking meditation, children enjoyed all the mindful games and drawing. 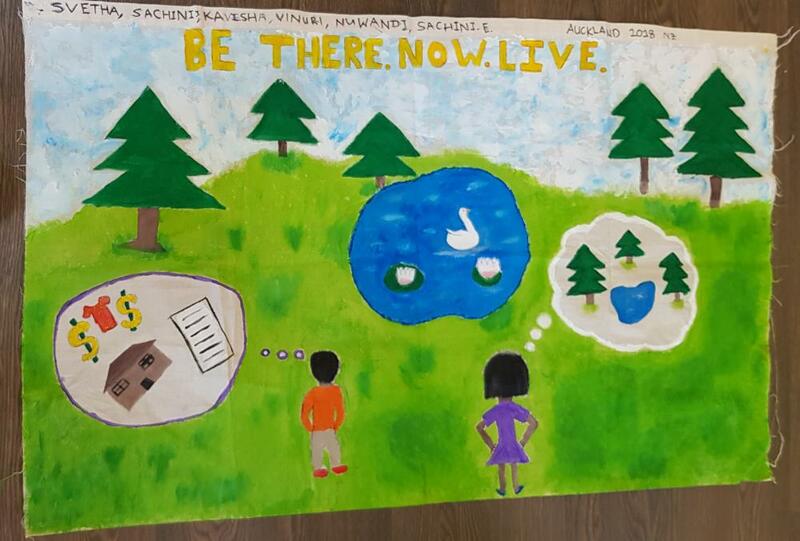 Some of their group drawings sent to Global Mindful Summit 2018 to as exhibits. They were shown short videos about mindful eating, mindful teeth-brushing, mindful showering. The four groups each made their own salad for the lunch and shared with other participants. Children enjoyed the forest walk and being in the nature listening to the sounds of the flowing stream, singing birds. They loved the experience of being silent observing nature. We also had several mindfulness Sunday schools in two temples. This was a half-day programme including mindful sitting, walking and several mindful games. We are planning a three-day Mindfulness Summer camp in Jan 2019. Contact Rukman if you want to know more.